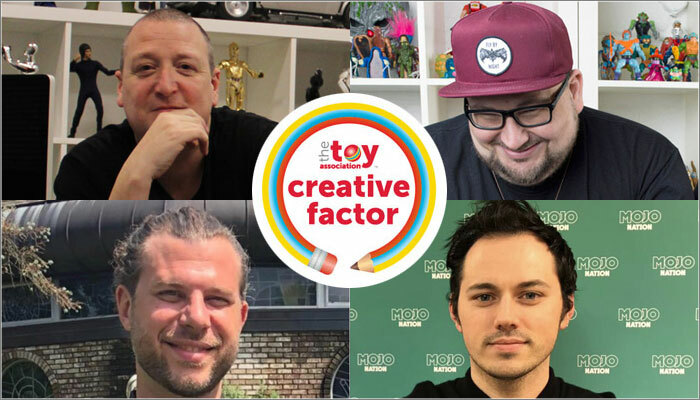 Mojo Nation’s Billy Langsworthy is to chair the Playing with Brands panel session at this year’s Creative Factor at US Toy Fair, featuring design execs from Triclops Studio, Alpha Group and Sweet Spot Studio. The Playing with Brands panel will take place at US Toy Fair on Monday, February 18th from 12:00 to 13:00 at Creative Factor (Level 1, Hall 1D, Lobby). The session aims to shed light on how designers engage with IP when developing licensed toys and games, dissecting the creative constraints and potential pitfalls involved in bringing much loved characters and IP to life in the toy aisle, as well as looking at how the industry’s relationship with licensing has evolved over the years. Rob Ames is co-founder of Triclops Studio, a visionary design consultancy specialising in concepting for the toys, games and entertainment industries. Triclops has contributed product design, features and characters to some of the world’s biggest brands, as well as creating the characters and early concept work for CBeebies’ BAFTA-nominated show, Go Jetters. Darren Lee Phillipson is VP of global product design at Alpha Group. “Every job I have had has given me a new set of tools for my belt,” Phillipson tells us, and when you look at his CV, it has to be one of the most impressive belts in the business. Whether it be pitching toy concepts direct to Hollywood legends like George Lucas and Guillermo Del Toro or coming up with ranges for mammoth brands spanning the likes of Sesame Street, Cars and Trolls, there’s never been a dull moment, and that looks to have continued with his role at Alpha. Jon Vanderbeek is the co-founder of Sweet Spot Studio, a Michigan-based invention house responsible for creating a raft of popular lines for the likes of Mattel, Hasbro and Fisher-Price since launching back in 2006. Having both been mentored under toy legends at Bang Zoom Design and The Obb, the Vanderbeeks have gone on to develop major brand launches for IP spanning Jurassic Park, Nerf, Thomas the Train and Hot Wheels, and also spread the love for invention by putting on STEAM workshops with kids from local schools in their town of Saugatuck. The Playing with Brands session is free-to-attend for all those registered to attend US Toy Fair. You can register for the show here.